﻿ Spring Valley Resort, Kep | FROM $33 - SAVE ON AGODA! "Great place, excellent staff, good location"
Have a question for Spring Valley Resort? "The location of Spring Valley is ideal, easy access to beach and national park walks." "Very lovely accomodation, great location and lovely staff." 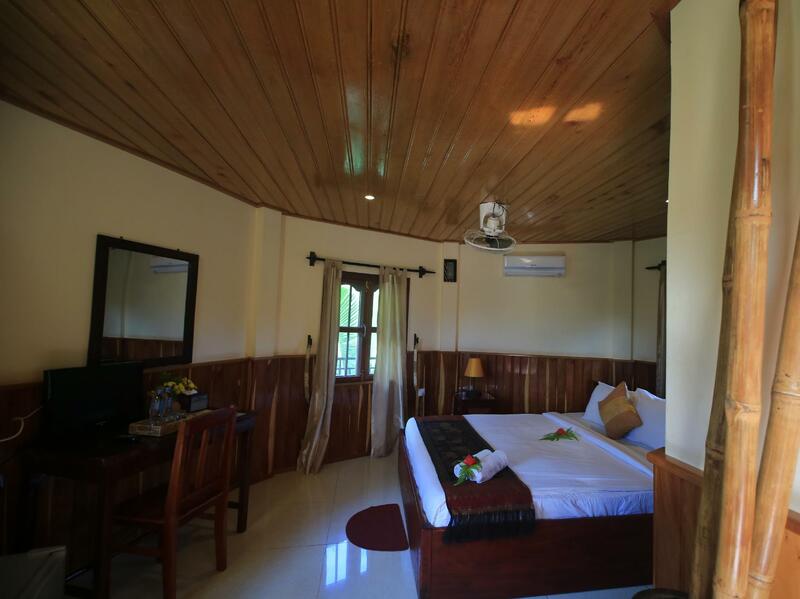 Nestled in the heart of Prey Thum, Spring Valley Resort is an ideal spot from which to discover Kep. Situated only 0.2 km from the city center, guests are well located to enjoy the town's attractions and activities. With its convenient location, the hotel offers easy access to the city's must-see destinations. 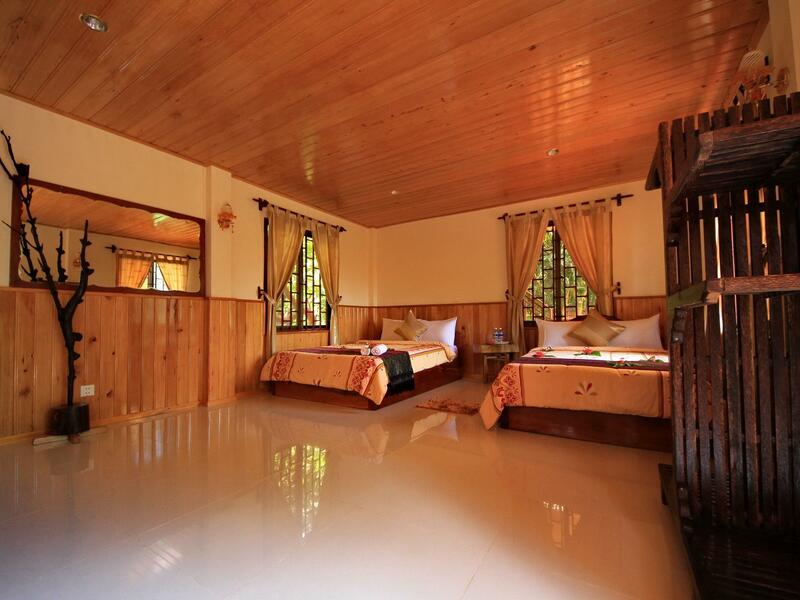 The facilities and services provided by Spring Valley Resort ensure a pleasant stay for guests. This hotel offers numerous on-site facilities to satisfy even the most discerning guest. In addition, all guestrooms feature a variety of comforts. Many rooms even provide clothes rack, mirror, slippers, towels, closet to please the most discerning guest. Whether you're a fitness enthusiast or are just looking for a way to unwind after a hard day, you will be entertained by top-class recreational facilities such as outdoor pool, massage, children's playground, pool (kids), garden. 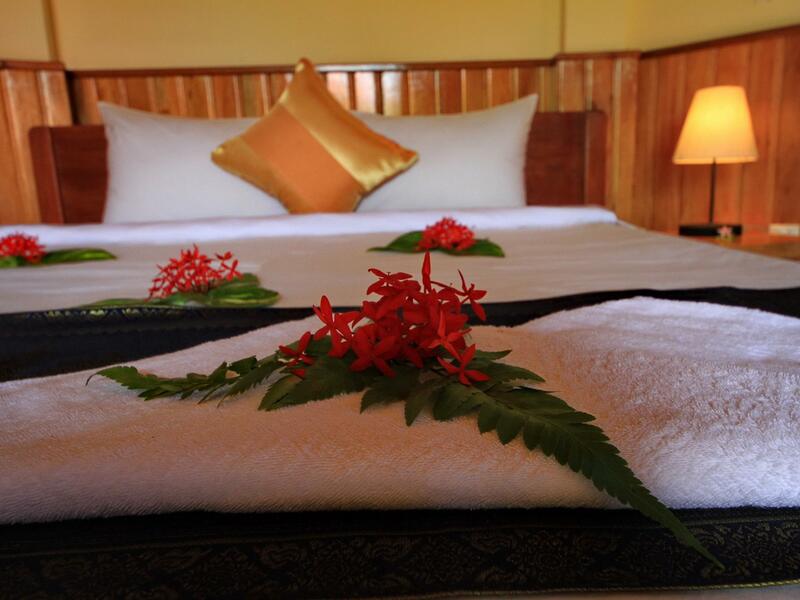 Spring Valley Resort is an ideal place of stay for travelers seeking charm, comfort and convenience in Kep. "Pros - Beatifull property, pool, friendly staff, restaurant..."
When booking room, the listing included a double bed and queen bed, but when I checked in there was only one double bed. I showed the staff member helping me that this wasn't what I expected to stay in and he immediately rectified the issue by putting us in the right room without any prolong explanation or excuses (not used to that when dealing with issues in Cambodia). Was quite shocked and impressed. Thank you Spring Valley for training your staff properly and honoring guests. It is greatly appreciated. 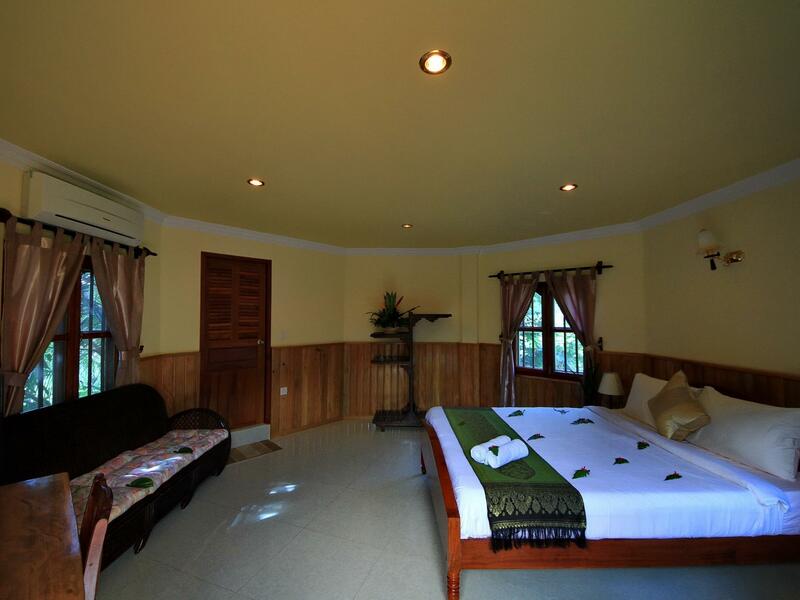 Spring Valley Resort is a beautiful hotel that is surrounded by a garden and tropical tree setting. The third floor of the hotel has a nice view of the ocean with a nice breeze at night that makes you want to just sit and relax on the balcony until late at night. The pool is nice and the beach is just 300 meters or a 5 minute walk away. We liked a French restaurant across from the beach, but there are many Khmer restaurants right near the beach. The hotel has a nice restaurant too. 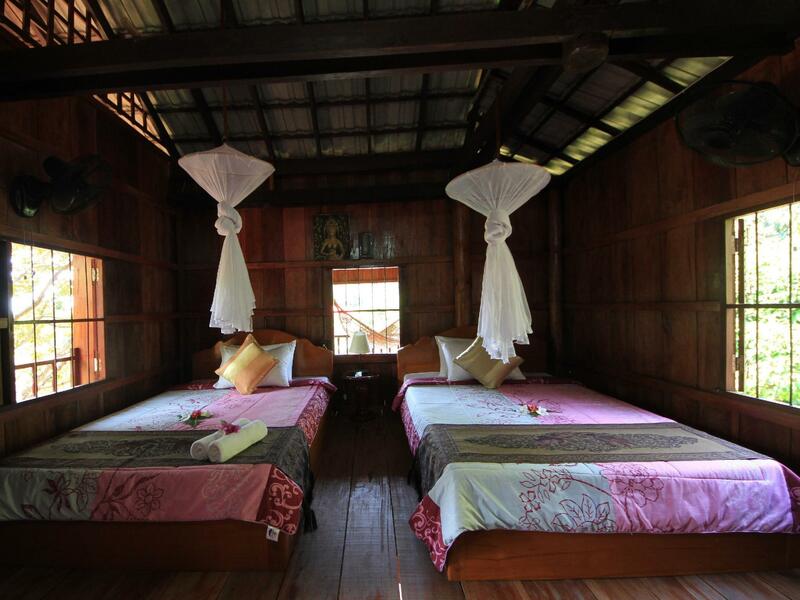 We recommend the hotel if you are going to the Kep and Kampot area. Lots of beautiful mountains around the area and behind the hotel. I travel all around the world and never had such a beautiful place before. I tot Cambodia was a busy town like phnom penh. But such place can deliver the peaceful and quiet really give me a sense of peacefulness. Near to the jetty to rabbit island. It is must to go! Dont miss it! You will love it! Bring your girlfriend or wife there. I tot it is better than maldives. 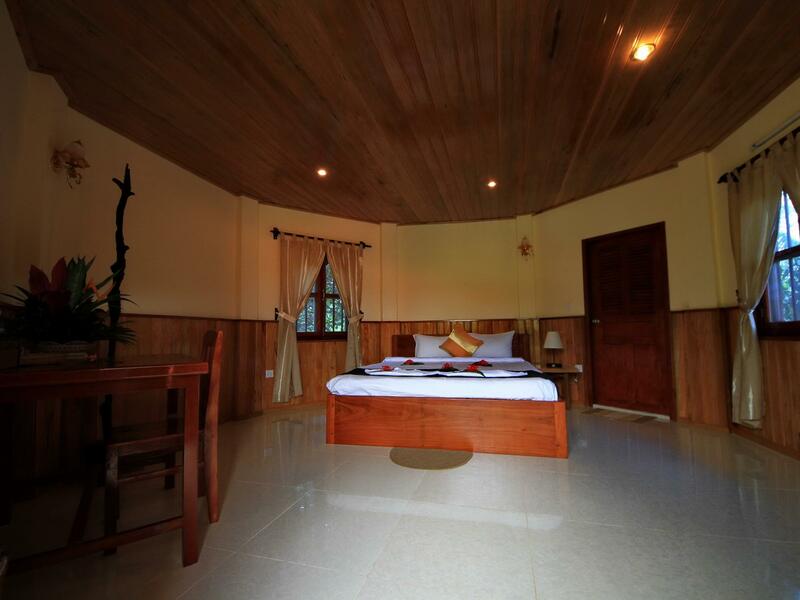 This is a very nice and tranquil resort next to Kep NP it has a very nice wild environment and a good pool we enjoyed our stay a lot it is in a very good location near the bus and places to rent bikes and motorbikes i reccommend this place with no doubt. This is a beautiful, tranquil resort with lovely staff. 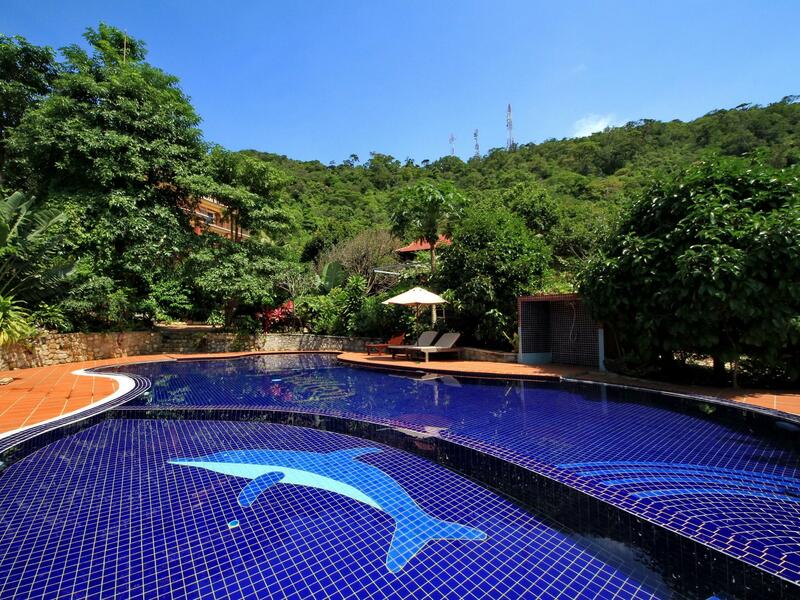 The surroundings are stunning with dense tropical forest one one side and the ocean on the other. I was upgraded to a bigger room which was really, really nice and had lovely ocean views. The staff here are fantastic! We stayed for 10 days in January 2013 and enjoyed a very relaxing and comfortable time. The rooms were a unique, circular design, set in beautiful gardens. The shower, TV and internet were top quality also. Breakfast was good and the evening meals were so tasty that we only ate out twice during our whole stay. What impressed us was the willingness of the chef to produce meals other than from the menu on request. The Cambodian owners had recognised the inherent deficiencies in Cambodian expertise at this stage of national development, and had had commissioned an Italian resort expert to make improvements and recommendations where necessary. It was clear that he was succeeding in putting a polish and professionalism onto the operation. As we left he was in the process of starting a small bakery on site to provide fresh bread and pastries as he was not satisfied with the quality of the 'bought in' bread. Overall, a very serene and relaxing experience. Recommended. We had a very pleasant stay at Spring valley. So much so,we are heading back in a few weeks time. On arrival we had booked into the Khmer wooden house but the staff were quick to point out that it had no air-con and was a bit dark. They offered to show us it but also some other rooms. We ended up in a double suite that had two double beds, air-con and a good bathroom. Great for us and our one five year old boy. The room was big and clean with a view of the sea. The hotel has amazing gardens . So very pretty and awesome stone pathways everywhere giving it an almost Mediteranean feel. The restaurant was good with local dishes , breakfast was yummy with freshly made pancakes, eggs all ways as well as fried noodles and rice and fruit/ toast etc. All very good. We loved the fact that we could just walk 5 mins to the beach area and it was easy to get a tuk tuk to take us to the port for Rabbit Island. All in all a great little resort. Well placed , great staff and good facilities. Request to change rooms was dealt with promptly. There is a beautiful sea view from the second and third level rooms. The location is very green and the staff always friendly and helpful. Seems to be a family-friendly hotel because there were several families with children. My family has stayed at this hotel multiple times over the years. We used to love it, but now not so much. They have put us three times in the room that attaches to the kitchen. It's dark, smelly and the kitchen staff is very LOUD. You can hear them talking and cooking during meal times. The smells from the kitchen are very strong. Also, we've had issues with the pool. In the pool the tiles are often missing, causing sharp places around the pool. One of my party split her foot open on the pool and had to be rushed to hospital with a serious wound that could not be stitched. We have complained about this issue but still find the pool tiles sharp. I will not be staying here in future if I can avoid it. I think we were the only ones in this hotel at the time , no one at breakfast so no buffet, and no one in the pool. Regarding the pool - get some new sunbeds and stop repairing the old ones as it looks shoddy and cheap, and clean up the shower area and get the shower working. Room was nice and spacious but a bit tired and dated. Small TV in corner of room with an old fridge. Toiletries provided but bathroom needs a makeover, remove old wall fixings and do a proper job rather than patch up. Outside seating on balcony was filthy , safe was a wooden box that you had to provide a padlock for. Overall we had a quiet peaceful stay but this place could be much better. Pros - Beatifull property, pool, friendly staff, restaurant has good food, close to great hike in the national park, very good breakfast. Cons - Very limited english, restaurant is expensive with no substitutions from menu. We stayed here for 4 nights in December. It's a very peaceful resort surrunded by lush green forest and within easy walk of the entrance to the national park and also the beach. The staff can arrange any trips or transport requests. I also left a laptop charger at th resort which the kindly sent all the way to Otres where I was then staying with their sister tou company. Food is provided by Mr Mab and is mainly local cuisine but good quality. Breakfast is basic but tasty.My kids loved the pool and the rooms were very spacious. There where not many pictures of this hotel, but it is really hard to take pictures of it. The hotel consists of a big lush tropical garden, with lots of greens, where a few buildings are placed consisting of one or two rooms per floor. The rooms are big, the sounds of the tropics where magnificent, I would love to return here. Would have stayed longer if possible! Stayed here for 2 nights - I don't think anyone else was here so it was very quiet but the pool is AMAZING! the rooms are also very nice and the included breakfast is great, eggs fruit crepes and orange juice. Only a 5 minute walk to the beach and 10 minute walk to the national park entrance. Recommend this place for a couple nights if your in the area. Hot water in the shower too and wifi works pretty good! Floors were still wet from mopping when I arrived...which shows they were mopped, at least, but still was uncomfortable. The restaurant is good but low-carb eaters will have a hard time finding absolutely anything in the menu that you can eat. Staff is friendly. Showers were altogether disappointing, basically the same as you get at a $10 guest house except for the hot water. Room (sea view) was nice, balcony was nice, view is indeed beautiful and peaceful. A nice place, slightly overpriced for what it offers (I think they think the beautiful pool will make up for it) but still a pleasant stay. One last thing: the grounds were overgrown and branches had to be ducked under to get to and from the room. An hour of branch trimming along the paths would go a long way to making this small repeated journey less tiresome. Hotel is next to the national park, opposite end from the crab market. Couple of restaurants 10 minute walk. Booked a superior double, was on the ground floor better to be on second or third for a view. Room is rustic/basic but quirky and adequate. Breakfast was good, bar and restaurant nice and the pool clean and spacious. Best of all was the hotel staff, very friendly, happy and helpful, best we encountered in Cambodia. Our initial experience was bad as they "forgot" to pick us up at the airport. When I called the person answering the phone first denied we were to be picked even though we had it recorded on our hotel reservation through Agoda, and then went on to say "it was too expensive". This situation gave us a bad "taste" and even though we received an apology, it was not the same. They did pay for our taxi on return to the airport which did help. Additionally we booked a day tour through the hotel to Rabbit Island on the return back the driver need not pick us up to take us back to the hotel. Again a bad experience. The hotel staff needs to ensure the customers are properly look after. The breakfast was tastey with good selection of food wth excellent bread and staff were very friendly. So I have discounted the rating due to the two bad experiences. Loved it, absolutely perfect relaxing holiday. Fantastic food. Great adventure exploring on hotel motorbikes. Restaurant was romantic and great vegetarian options. Laundry service was fantastic. Staff were so friendly. Location was paradise in the National Park near to beach and crab market.